To put it simply, a bed riser is like stilts that you can use for any bed. It stays between the frame of the bed and the ground so as to elevate the bed. This gives you more space underneath to store stuff. While the design and dimensions of each bed riser will differ from product to product, the main style remains the same. This involves a block which has a lip to avoid bed posts jumping out. Not every bed riser can lift a bed to the same level. The general height ranges from 1 to 5 inches. This may not seem like a lot, but if you add in your bed’s own height as it stays off the floor, you get to have a lot more space to squeeze stuff under the bed. Who can use a bed riser? Although some people use these risers to make extra space for storage, they actually have a lot of other uses. For example, people can use risers to raise their beds or other furniture pieces for cleaning spaces that are otherwise hard to reach. Many older people with hip issues can use bed risers as well to raise their bed higher, which makes it more convenient for them to easily get in or out of bed. For a lot of people with taller heights, low-level beds can cause lower back issues from sitting for prolonged periods. Adjusting the bed height for their leg space can help get more room so as to avoid body aches. Lastly, bed risers are ideal for people who may have weakened bed frames with boards that have sunk over time. The added height from the riser can adjust the bed to its original height. How do you choose the right bed riser? There are two main bed riser types: wooden and plastic. 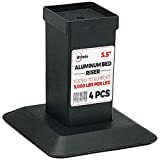 While plastic risers can be a great solution for single units, they don’t give you the same level of durability which can handle a lot of weight when it comes to heavier beds. As we all know, most regular-sized beds aren’t exactly the lightest, unless you have kid’s beds or single units. So, be sure about the size of your bed before choosing the material. Wooden bed risers like those made of solid oak tend to offer longer durability and also come in much better designs and colors which work with home interiors and other bed frames very conveniently. While plastic does come for cheaper, over time the risers can wear out from excessive weight strain and finally give way. Once you have figured out what kind of bed riser is the ideal for your use, the next thing is to measure your bed frame. Bed risers mostly come with a list of measurements for the appropriate diameter that they will be able to accommodate. Getting a bed riser for a bedpost that is bigger than its own measurements can end up with the riser slipping out from under the bed as you are sleeping. Another important aspect is the height that the bed riser will elevate your bed too. This means you have to decide about the height you need to add to your bed. The best way to do this is to calculate the height of the biggest object you plan on storing underneath your bed. Then, just get the appropriately sized bed riser that can elevate your bed to the right number of inches for storage and height. Last but not least, you have to make sure to count the number of legs your bed has. 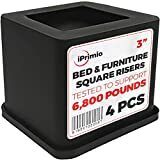 A lot of bed risers generally come in a pack of four. What this means is that if you have a bed that has six legs, you will be required to purchase two pairs of bed risers to accommodate the bed. The Slipstick CB654 Bed Riser will help you get just enough space for cleaning and storage. They are designed using premium materials to maximize function and efficiency for a long period of time. On the base of each lifter, you have a rubber stopper that prevents the bed from wobbling. Not just that, but with this rise, you’ll be able to hold about 2000 pounds. 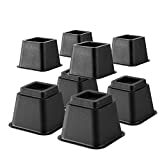 The risers also have recessed holder cups that come with memory foam padding which locks ideally in any bed or furniture. The rubber bases are also ground-friendly, so you won’t have to worry about dents, scratches or other floor damages. To raise either the top or bottom of the bed, all you have to do is use two lifters. Besides elevating your bed, the riser is also great for raising other furniture like chairs, desks, armchairs and other four-legged pieces. With its durable design, the Slipstick CB654 is ideal for both home and work use. This bed riser system quickly provides an extra height of about 3 inches. It helps users get just enough storage underneath their beds, seeing as it has a high bedpost diameter of about 2.75 inches. The one drawback of the risers though is that they aren’t adjustable, so you’ll have to work with what you’ve got. You can stack the bed risers together after use for easy storage. The casters fit safely and reliably into the recess cup that comes in-built in the riser. So, you won’t have to worry about collapses. The riser accommodates almost any regular bed type and comes with a 0.75-inch elevated edge to keep the bedpost fixed in place. Ryehaliligear’s Easygoing bed riser includes heavy-duty durable plastic, which can handle even the bulkiest furniture in your house. They easily support a total of about 5720 pounds, which is pretty great. You can even raise the head or foot of the best for specific medical conditions. So, if you want a great pair of risers for a platform bed, this is the way to go.